We hope you guys have a pretty good handle on the root 6 pentatonic scale! In this lesson we’re going to introduce some patterns you can use to practice your pentatonic scale and get more fluid with it. 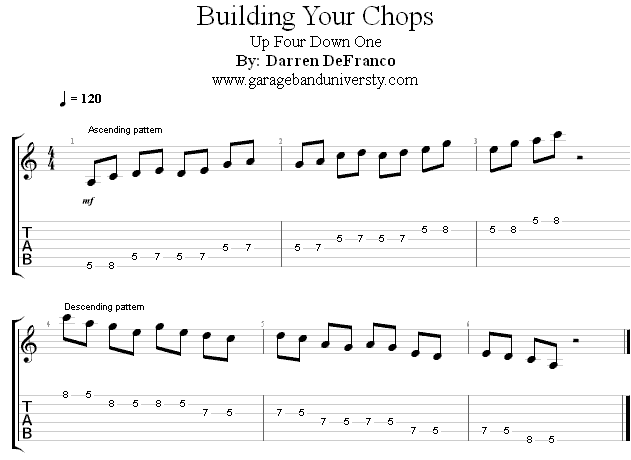 Many solos are built off of patterns like these so it’s important to practice them. This one involves going up four notes in the scale and then backing up one before repeating. Use a metronome and practice this pattern at a slow speed at first, maybe play quarter notes at 70bpm. As a goal, try to get it up to 80bpm before moving on!